As seen on TV - Pro wrestling at its best. Come and enjoy a free* night out for the whole family. Great fun, good food (affordably priced) and easy access parking with wheelchair friendly amenities. Meet your favourite stars after the show. For more info, please call us on m 0413 995 720/0449 185 447. *General Seating is free! 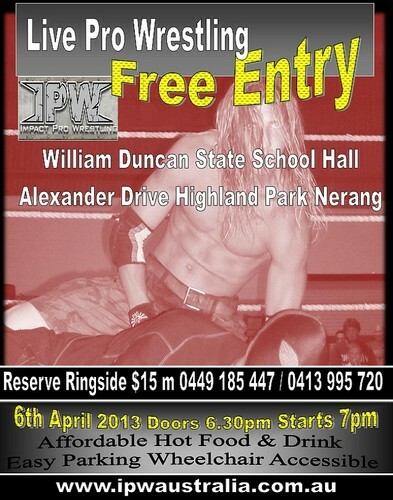 Ringside seating $15 - buy your tickets here using the above link. Free seating is on a first-come, first-served basis.